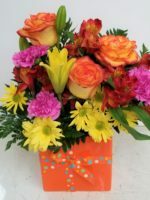 If Sunflowers are her favorite flower, then this arrangement of Spray Roses and Sunflowers is for you! 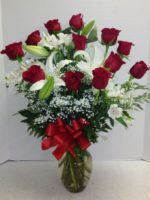 Spray Roses and Happy Sunflowers! 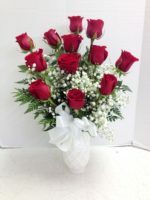 Let us design and deliver Spray Roses and Happy Sunflowers, accented with spray roses and pretty greens in a cube or bubble bowl. 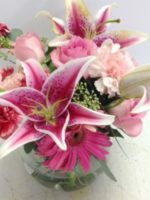 Perfect for a desk or a hospital room, these pretty arrangement will brighten the room and bring the sunshine in. 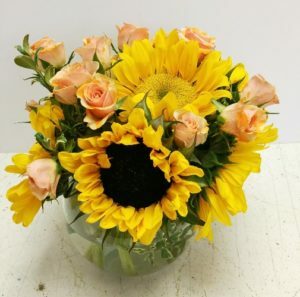 If Sunflowers are her favorite flower, then this arrangement is for you! 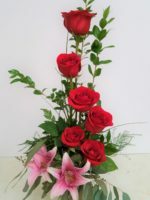 Perfectly designed in a cube or bowl, it’s bright, cheerful, not too large and not too small! 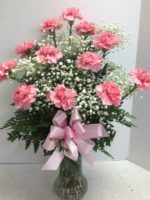 Pamela E Smith, Graduate of Michigan State University Floriculture and owner of Roadrunner Florist, has been designing stunning floral arrangement for more than 50 years. 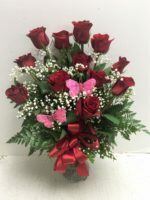 Basket Express is located inside Roadrunner Florist, giving you the best of both worlds by offering not only the freshest and most beautiful floral arrangements but also custom designed gift baskets. 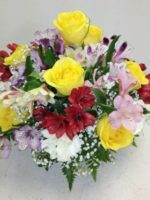 You might prefer our Think Yellow Bouquet or our Spread Sunshine Arrangement.